Construct a path to success. The Balanced Leadership for Women Course 3439 course will use four modules to help women leaders become stronger. The first module is Meaning, which will enable you to gain happiness through effective leadership training. This course will help you start by understanding your strengths and weaknesses and building your character from there. The second module is Framing. Upon gaining an understanding of your strengths and weaknesses, use your newfound understanding of self to determine what type of leader you are: A pessimist? An optimist? Adaptable? How do you confront obstacles? Once you have framed your leadership identity, you are ready to move forward. The third module is Connecting. You must learn how to connect to the social world around you to become a capable woman leader. Building relationships through all stages of your career develops your skills as a leader and strengthens your needed network when you want to move up. Finally, you will combine all three modules—Meaning, Framing, and Connecting—to commit to that step forward in your lives as happy leaders. The fourth module, Engagement, will teach you how to engage the previous modules into your life as a leader outside the class. As with most of our continuing education courses, this class is an independent study, meaning all materials needed for a successful course completion is online. For technical support at all hours, a student helpdesk is available. 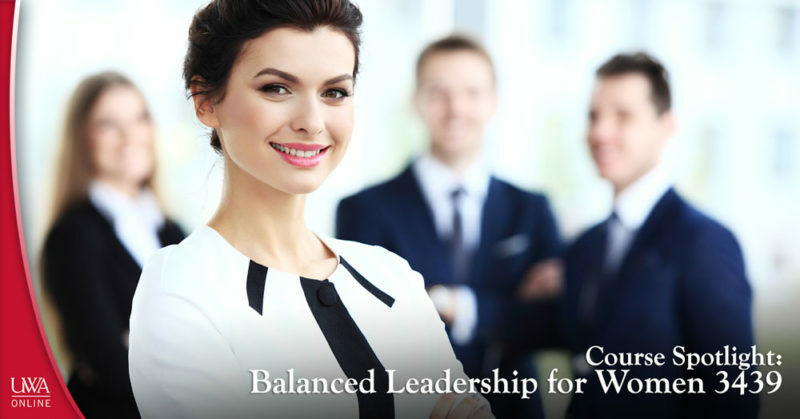 For more detailed information about Balanced Leadership for Women 3439, visit the course registration home page. From there, you can also register for the course, which closes on Friday, December 15, 2017. For more course spotlights and information of continuing your education, visit our UWA Continuing Education blog! For more of our class listings, go to www.uwa.edu/ce! We all feel jaded from time to time, especially when it comes to our careers. Maybe you’re tired of the same routine day in and day out. Perhaps you feel like you are not being challenged enough. Or maybe you know that you could be making more money in a different career field altogether. Feeling like you are stuck in a career rut can take on many forms, and therefore, so can the tactics that can help you climb out of it. One of the ways that you can help yourself escape from a career rut involves continuing education. In this instance, you don’t have to think of continuing education as necessarily going back to school; rather, you are continuing to learn new skills as you advance in life and your career. 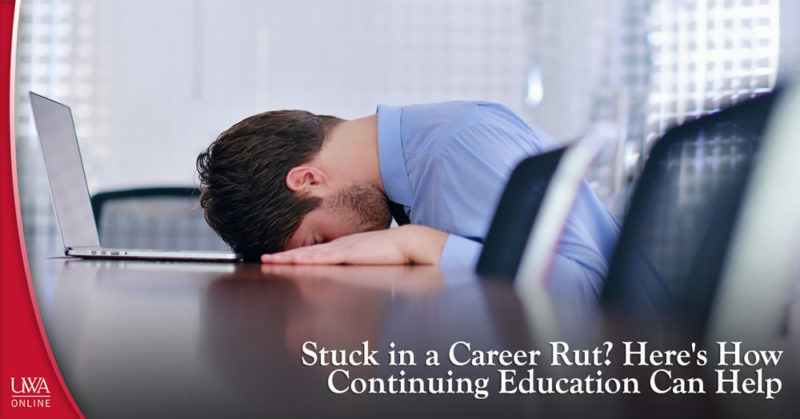 Here are a few specific ways that continuing education can help if you find yourself stuck in a career rut. You can regenerate interest in your current position. Feel like you’re bored with the job you’ve been doing for years? By enrolling in continuing education courses, you can perhaps re-spark the interest you once had for your career by getting up to date on the latest ideas and technologies circulating in your field. You may be surprised at how your industry has evolved over time, and you might feel like your job is less mundane by pursuing a new and relevant skill. You can advance in your career field. If you’ve been in the same career position for a while, it may be time to move on. If you make the move toward earning an advanced certification or seek a specialization in your field, it will put you in a better position to be able to move up the ranks and advance to a higher and more prestigious position within your company. In other words, get certified for a specialized skill via continuing education, and your resume will receive a boost. You can get a raise. Along the same lines, there’s no better way to get out of a career rut than to get a little extra compensation. The certification or specialization you pursue via continuing education is an investment back into yourself—one that can literally pay off. If employers see you as being more qualified, then you can justifiably charge them more for your hard work in exchange. You can change careers entirely. Perhaps your career rut is pointing you down a new path entirely. Instead of paying exorbitant amounts of money to go back to school on campus for an undergraduate degree, consider continuing education as the less expensive and easier option. It is possible to start from scratch as an adult and end up with a certification as a dietician, for example, all through self-guided online continuing education courses. Online courses especially allow you to flexibly work classes into your busy schedule. You can discover a new passion. Is there a topic you have always been interested in, but you’ve never had time to delve into it? If you are stuck in a career rut, continuing education can expose you to a new career passion that will leave you much happier in your daily routine. You may not necessarily know that you have a love for horticulture until you take that initial introductory online course. You’ll never know until you try! Don’t waste another minute languishing in your career rut. Consider continuing education today! It’s as easy as browsing our course offerings and registering for the courses you are interested in. You do not have to be a UWA student to apply! Check out our courses at www.uwa.edu/ce. The sustenance that you put into your body on a daily basis can be the most direct variable positively or negatively affecting your health. Especially if you need help getting a particular health issue under control, paying close attention to the foods you are eating can make all the difference in terms of whether or not you are living a healthy lifestyle. 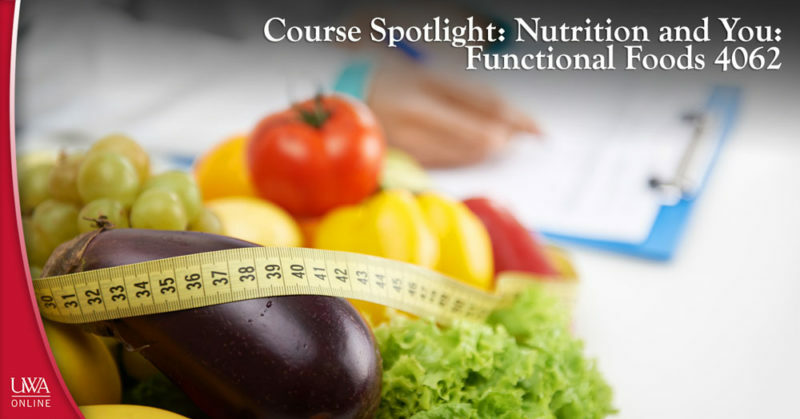 In Nutrition and You: Functional Foods 4062, participants will study the effect that particular foods have on overall health and specific health issues. From the benefits of cocoa on cardiovascular health to the amount of spices and herbs that you should consume as part of your daily diet, Nutrition and You: Functional Foods 4062, will teach you what to eat in an effort to prevent common diseases such as diabetes, cancer and heart disease. Why some functional foods should be included in the diet. The names of many health benefits of specific functional foods. Translating the health benefits of specific functional foods into practical application for the general American diet. Understanding how antioxidants work and communicating that knowledge effectively to the general public. The free radical theory and what it means. 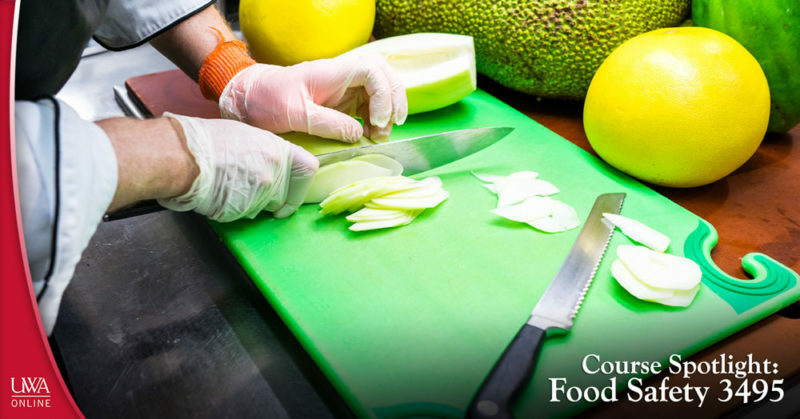 The cost of tuition for Nutrition and You: Functional Foods 4062 is $195, and all materials are included in the cost of the course. Registration for this course is open through Dec. 15, 2017. Do not wait until it is too late to start introducing yourself to a better diet. Take charge of your physical health today with Nutrition and You: Functional Foods 4062! To register for Nutrition and You: Functional Foods 4062, click here. To browse our entire selection of online continuing education courses, visit UWA Online Continuing Education e-Learning at www.uwa.edu/ce! Though annual HIV infections and diagnoses are declining in the United States, 1.1 million people in the U.S. are still living with HIV, and one in seven do not know it, according to the Centers for Disease Control and Prevention. Though significant progress has been made in the decline of new cases of HIV/AIDS being reported in the United States year after year, there are still opportunities to continue to improve—especially on a global level. At UWA Online, our Continuing Education e-Learning program offers a handful of HIV and-AIDS-related continuing education courses to benefit healthcare professionals and the general public in an effort to help them better understand the virus and disease. This course is designed to help healthcare professionals understand the human immunodeficiency virus (HIV) and how it can lead to acquired immune deficiency syndrome (AIDS), as well as the OSHA guidelines associated with them. Participants will learn how to define the HIV life cycle, distinguish between different populations and the prevalence of HIV, select facts about AIDS and drug abuse, identify issues related to pregnancy and HIV and pinpoint ways to prevent HIV transmission. Cost: $105. Register here. This course will cover the basics of HIV/AIDS for anyone interested in learning more about the topic. Participants will learn to identify the signs and symptoms of HIV/AIDS, determine the ways that the HIV/AIDS virus is contracted and spread, recognize ways to prevent contracting the virus, define the HIV/AIDS life cycle and identify certain risk factors associated with HIV/AIDS. Cost: $40. Register here. In this online continuing education course, participants will identify which groups are historically the most affected by HIV/AIDS as well as the groups where HIV infections are increasing. The course will cover preventative strategies in place or under development to educate special populations about HIV/AIDS, steps currently being taken by the CDC to reduce the incidence of HIV infections and AIDS and the impact of HIV/AIDS on different age groups, racial/ethnic groups and other special risk groups. Cost: $40. Register here. By nature of their work, healthcare professionals are at risk for on-the-job exposure to blood-borne pathogens like hepatitis B, hepatitis C and HIV, which can occur via coming into contact with an infected patient’s blood. This course will cover the risks of HIV transmission for healthcare providers as well as what steps they can take to prevent it from happening while working. The course will cover what to do if exposure occurs, the risk of infection after exposure, treatment options after exposure and the follow-up treatment steps necessary after exposure. Cost: $40. Register here. As stated above, one in seven people is living with HIV and doesn’t know it, the CDC estimates. Modern technology has made HIV testing faster and more convenient than ever. This course will cover testing options and what you can do to protect yourself from acquiring HIV if you test negative. Topics covered in this course include why HIV testing is important, who should get tested and when, how HIV tests work, the different types of HIV tests currently available and the next steps that those with positive HIV test results should take. Cost: $40. Register here. Designed for people ranging from the everyday individual to the healthcare professional, these HIV and AIDS-related continuing education courses intend to spread awareness for the disease and educate the public on preventative measures and treatments. 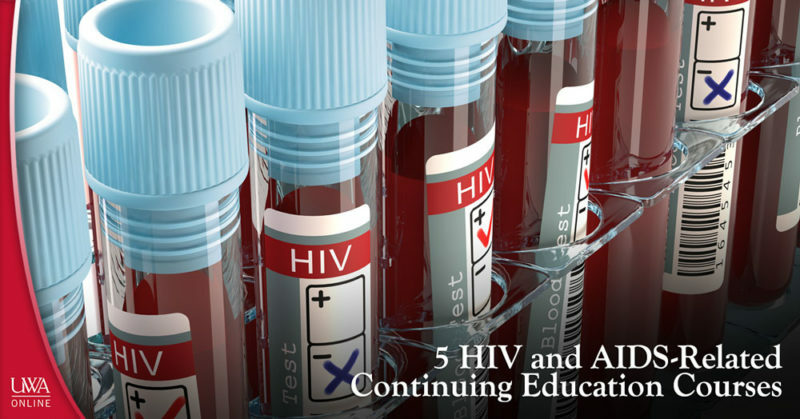 Register for one or several of these HIV and AIDS-related continuing education courses and get started today. To view UWA Online Continuing Education e-Learning’s entire course offerings, visit www.uwa.edu/ce! When it comes to deciding on a place to pursue continuing education, you want somewhere that has a proven record of excellence. Even if you are planning to take continuing education courses online, you may want to take into account the reputation of the brick and mortar school itself. Aligning your continuing education with a recognizable school that carries itself well in the eyes of others will therefore make your own continuing education efforts stand out. 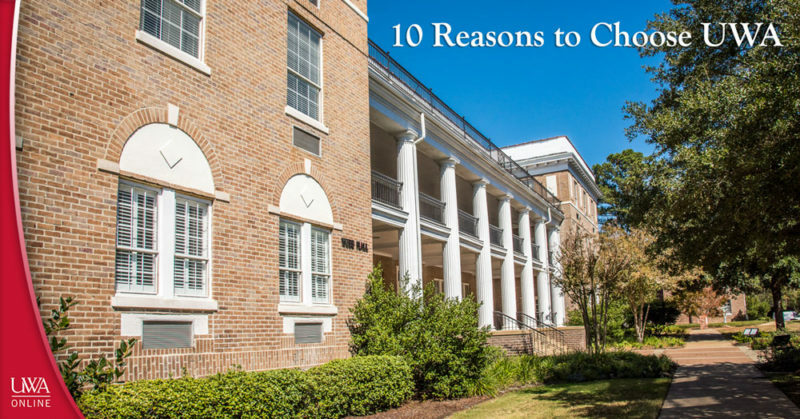 That being said, here are 10 reasons to choose UWA—as an undergraduate, graduate or lifelong learner! UWA offers something for everyone. Offering associate, bachelor’s and master’s degree programs, as well as non-credit continuing education certificates, UWA will likely have what you’re looking for. The university boasts programs in business, education, liberal arts, nursing, natural sciences and math, with more than 60 undergraduate programs and 20 graduate programs. UWA professors maintain a passion for the profession. In addition to consistently being recognized for their published works, outreach and service projects and leadership across a selection of venues, UWA teachers are passionate about teaching—period! UWA students thrive on individualized attention. On campus, students enjoy a 15:1 student-to-teacher ratio—not like the stadium-seating classrooms you’ll find at some other state schools. Even through our online courses, students will always be connected to a helpful human resource in the event that he or she needs assistance. UWA’s campus is abuzz with activity. Greek life, sports teams, performing arts, student government—you’ll find it all at UWA. Even if you are not an on-campus student, UWA regularly hosts a number of activities that are open for the community to attend. UWA delights nature lovers. UWA’s bucolic 600-acre campus in rural west Alabama features nature trails and a stocked 54-acre lake for fishing. UWA is historic. UWA piques historical interest—with its storied past as an all-women’s school to the architecturally significant historical campus buildings that have seen thousands walk down their halls over the decades. UWA stays up-to-date. While budding with history, UWA also offers students and staff modern conveniences from classrooms to labs to residence halls. The university strives to employ top technological resources to better the learning environment. UWA is affordable. UWA’s tuition (for all types of classes) is lower than most state universities in Alabama. UWA also offers grants, scholarships and loans to help students pay for school. UWA is a lifelong community. Once you make ties to UWA, you’ll be in the UWA family for life. With all of the above reasons to choose UWA included, you can see why it’s a community that you’ll want to be associated with! UWA stays connected. You’ll find free Wi-Fi on all corners of UWA’s campus! Regarding reasons to choose UWA, the list goes on and on. 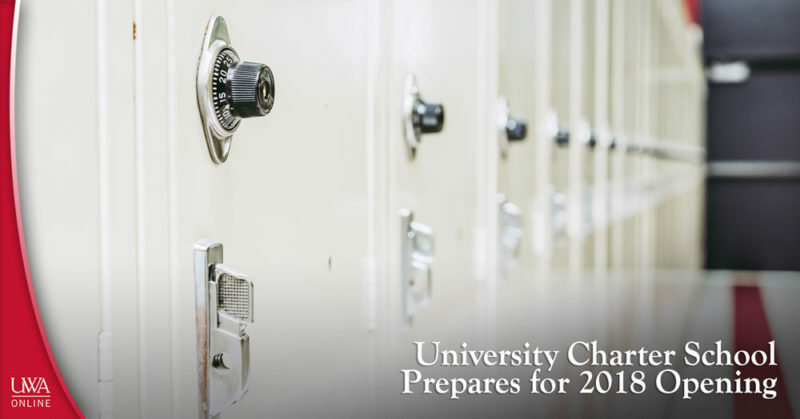 However, we’re confident that once you do become a UWA Tiger—whether as a just-starting college student or retiree seeking personal learning courses—you’ll be thrilled at your decision! To learn more about UWA Online Continuing Education, visit www.uwa.edu/ce! *Blog adapted from “Why Choose UWA?” on www.uwa.edu. As human kind progresses toward more and more advanced technology, the system by which we gather information has changed. Capturing, Processing, and Protecting Information 3615 will help students understand this change in information technology as well as our part in it. Data seekers obtain information in two ways: manually and electronically. Once contained, analysis transforms the data into useful information that appropriate channels, such as businesses, use in decision making. To ensure reliability and security for the business and the individual, reliable and consistent methods protect information for use by authorized users. Obtaining and applying information in ethical practice is important for a business manager where the information he or she encounters will shape future actions. Everyone uses information to different degrees; new knowledge can shape ideas, decisions, and behaviors. The internet brings us an onslaught of information every day, perhaps more than in any generation. 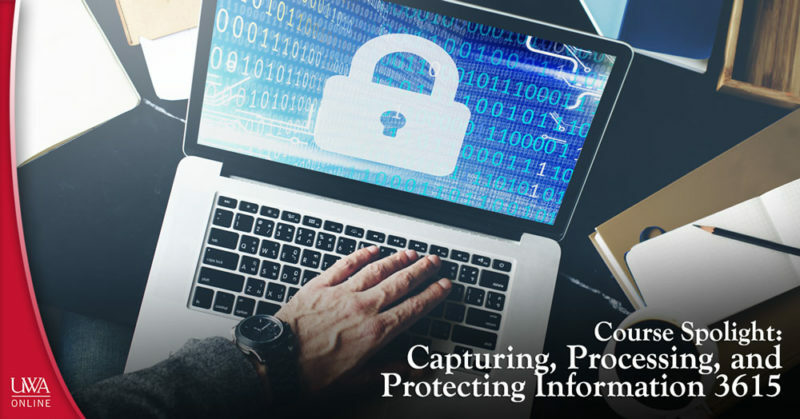 Capturing, Processing, and Protecting Information 3615 will demonstrate the methods information system use to capture, process, and protect information; furthermore, the course will teach the application of information. This online course is considered an independent study, and students are allowed to work at their own pace with the materials provided by the course. For technical support, students can contact the student help desk during course enrollment. Recommended hardware requirements include access to broadband, DSL, or wireless internet; dial-up internet may cause problems loading pages and viewing videos and images. Google Chrome is preferred, and pop-ups and cookies must be allowed. A PowerPoint presentation viewer, PDF viewer, and media player are also recommended. Registration for Capturing, Processing, and Protecting Information 3615 ends Friday, December 15, 2017 at 12:00 AM. Tuition for the course is $40.00. For additional information, please view the course description webpage. For a listing of UWA Continuing Education courses, feel free to browse our other offerings! Continue following the UWA Continuing Education blog for more course spotlights! From juggling exams and projects to balancing your work and social life, being a college student can be stressful. Every decision, whether academic or personal, is one that can either positively or adversely affect the rest of your life. One choice that you may make as a college student is to enhance your resume and skill set by taking non-credit continuing education courses while also taking classes that will count toward your degree. Sound overwhelming? People do it every day, and you can, too, by learning what to keep in mind when managing continuing education courses as a college student. Choose your continuing ed courses wisely. When managing continuing education courses as a college student, you want to make sure that the non-credit continuing education courses you are taking are ones that will complement the credit courses you are already taking. Sure, if you are a health sciences major, and you have time to take a continuing education photography course for fun, then go for it. But if you are strictly seeking continuing education for the sake of making yourself marketable to potential employers, then you might want to opt for something more along the lines of kinesiology or exercise science, for example. When choosing your continuing education courses, you should also make sure you choose ones that make for a good balance between your degree courses and your non-credit courses. Neither should weigh you down in terms of time or ability. Create a quiet, clean and organized studying environment. 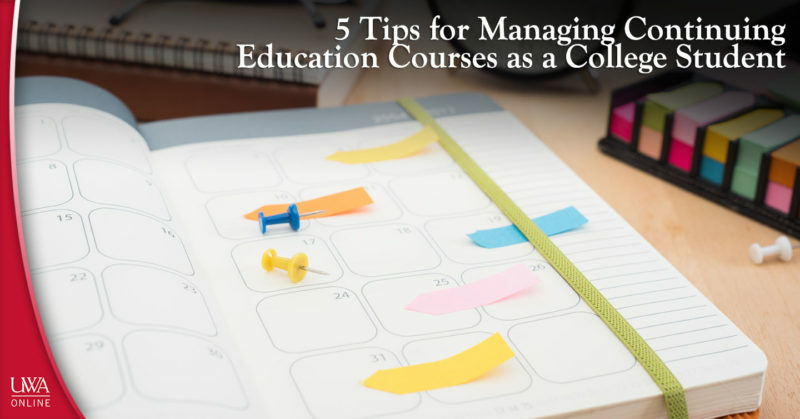 Another important tip for managing continuing education courses as a college student involves cultivating a study and work environment that is conducive to learning. Many continuing education programs, like UWA Online, offer online-based courses that require a well-working computer and strong internet connection. If the campus library is crowded, you’ll want an alternative space to complete your online continuing education lessons, discussions, projects and exams without being disturbed. Pick out a space in your dorm or apartment that you can dedicate to maintaining an efficient working space. Prioritize your continuing education courses. When things get busy, you may feel that something has to give—and you may choose your non-credit courses over your for-credit ones. If that’s what you choose to do, then that is your prerogative. However, you should prioritize your continuing education courses on the same level as your degree courses if possible. After all, you did pay for them, so letting them fall by the wayside is not only a missed opportunity, but it is a waste of money. If it doesn’t help you, don’t do it. Don’t take continuing education courses just for the sake of taking them if doing so is not going to help you in the long run. Because they are non-credit courses, you will not necessarily have credit hours to show for them, but what you should have to show as a result of successfully completing them is an acquired skill, advanced knowledge or some other benefit. If the courses you are taking will not help you achieve any of these end results, then perhaps you should reconsider your decision to take them—especially while also working as a college student. Remember why you sought out continuing education. If you get discouraged, remind yourself why you sought out continuing education courses in the first place. Having career-specific courses and certifications on your resume can make the difference between you and your competition being hired for a position. Use this as a motivator when managing continuing education courses as a college student! Getting a head start on continuing education while you are still a college student can help you secure a coveted position in your career field. To learn more about UWA Online’s course offerings, visit www.uwa.edu/ce! In addition to continuing education, The University of West Alabama continues to make strides in its undergraduate fields of study—most recently, in its exercise science program. The UWA Exercise Science Program recently received national recognition when the school was labeled an NSCA Recognized School from the National Strength and Conditioning Association. The NSCA Education Recognition Program (ERP) “recognizes and distinguishes schools with strength and conditioning or personal training curricula that prepares students for NSCA certification exams,” according to the NSCA website. The recognition will add merit to degree holders of UWA’s exercise science program, which is offered by the physical education and athletic training department. Schools that receive approval for the NSCA’s ERP do so based on a demonstrated commitment to course material that prepares students for NSCA certification. UWA’s exercise science program has been growing significantly over the past six years, according to Dr. James Robinson, associate professor of exercise science and director of UWA’s exercise physiology lab Robinson expects the program to have 200-plus enrollees by fall 2018. 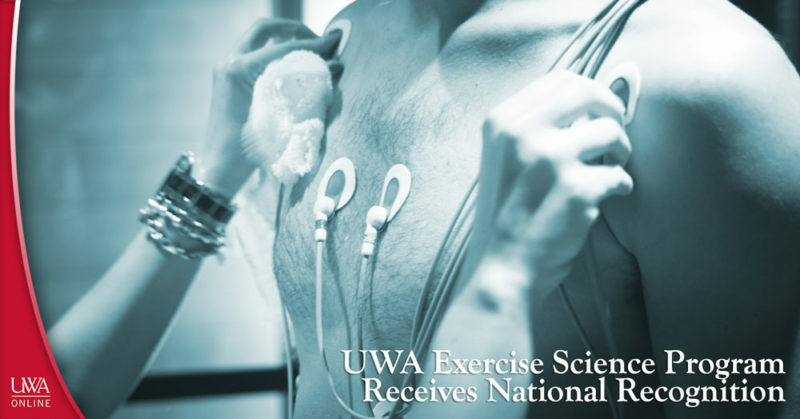 Students majoring in UWA’s exercise science program complete 60 combined hours of coursework in exercise science, physical education, chemistry and physics. In addition to majoring or minoring in exercise science at The University of West Alabama, students and non-students have the opportunity to continue their health and wellness-related educations with UWA Online Continuing Education e-Learning! Our program offers a variety of non-credit courses that can benefit someone interested in augmenting his or her skills pertaining to exercise science-based careers. To browse our health and wellness course offerings, click here! For our entire listing of online continuing education courses, visit us at www.uwa.edu/ce!